Tuberculosis of the kidney and urinary tract is, like other forms of the disease, caused by members of the Mycobacterium tuberculosis complex. By far the most common causative organism is the human tubercle bacillus, M. tuberculosis, but the bovine tubercle bacillus, M. bovis, occasionally can be responsible. The vaccine strain, Bacille Calmette-Guérin (BCG), also has been the cause of renal lesions as a complication of intravesical instillation of BCG for the treatment of superficial bladder cancer. The members of the M. tuberculosis complex are obligate pathogens and, together with M. leprae, differ from the many other species within the genus Mycobacterium, which are free-living environmental saprophytes and are commonly found in water, including piped water supplies. Some of these so-called environmental mycobacteria occasionally cause human disease, particularly in immunosuppressed individuals, including recipients of renal transplants (1). The kidney may be involved when environmental mycobacteria cause disseminated disease, such as that caused by M. avium in AIDS patients. Renal disease caused by environmental mycobacteria in nonimmunosuppressed individuals is exceedingly rare (2). However, because they occur in water, environmental mycobacteria readily contaminate the lower urethra and external genitalia and, thus, often are isolated from urine samples. Globally, tuberculosis is a common disease, with 8 to 10 million new cases annually and a rising incidence, particularly in regions with a high incidence of HIV infection. Most often the lung is affected, but, after lymphadenopathy, the most common form of nonpulmonary tuberculosis is genitourinary disease, accounting for 27% (range, 14 to 41%) of nonpulmonary cases in several surveys in the United States, Canada, and United Kingdom (3). In developed countries, nonpulmonary tuberculosis is relatively more common in patients from ethnic minority groups, the exception being genitourinary tuberculosis, which is uncommon in these groups. In the United Kingdom, the latter accounts for 5% of cases of nonpulmonary tuberculosis in ethnic minorities, mostly those of Indian subcontinent ethnic origin, compared with 27% of such cases in the European (white) population. This is, to some extent, age related: when patients of white and of Indian subcontinent ethnic origin were stratified by age, the incidence of genitourinary tuberculosis was similar in the two groups in each age band (4). Tuberculosis caused by M. bovis is now uncommon in industrially developed nations, accounting for fewer than 1% of all cases of tuberculosis. It is usually due to reactivation of old, dormant disease, although cases have occurred in younger, HIV-positive patients (5). In approximately 25% of cases caused by reactivation in older persons, the genitourinary system is involved (6). Such disease has a somewhat bizarre veterinary health significance because a number of farmers have infected cattle by urinating on hay in cowsheds (7). Tuberculosis of the urinary tract is easily overlooked. Many patients present with lower urinary symptoms typical of “conventional” bacterial cystitis, and suspicions of tuberculosis are aroused only when there is no response to the usual antibacterial agents or when urine examination reveals pyuria in the absence of a positive culture on routine media. Other symptoms that sometimes occur include back, flank, and suprapubic pain; hematuria; frequency; and nocturia; these might also suggest conventional bacterial urinary tract infection. Renal colic is uncommon, occurring in fewer than 10% of patients, and constitutional symptoms such as fever, weight loss, and night sweats also are unusual. Only one third of patients have an abnormal chest x-ray. In one study, 18 of 25 physicians with renal tuberculosis presented only after advanced cavitating disease had developed (8). Indeed, the diagnosis sometimes is made for the first time at operation or post mortem. The diagnosis of tuberculosis of the urinary tract is based on the finding of pyuria in the absence of infection as judged by culture on routine media. In early disease, it often is possible on intravenous urography to detect changes in a single calyx (Figure 1) with evidence of parenchymal necrosis, and typically there is calcification on the plain film. In more advanced disease, urography will show calyceal distortion, ureteric strictures (Figure 2), and bladder fibrosis. Ultrasound examination of the urinary tract may reveal renal calyceal dilation and more overt evidence of obstruction. (A) Plain film showing calcification in the lower pole of the right kidney. 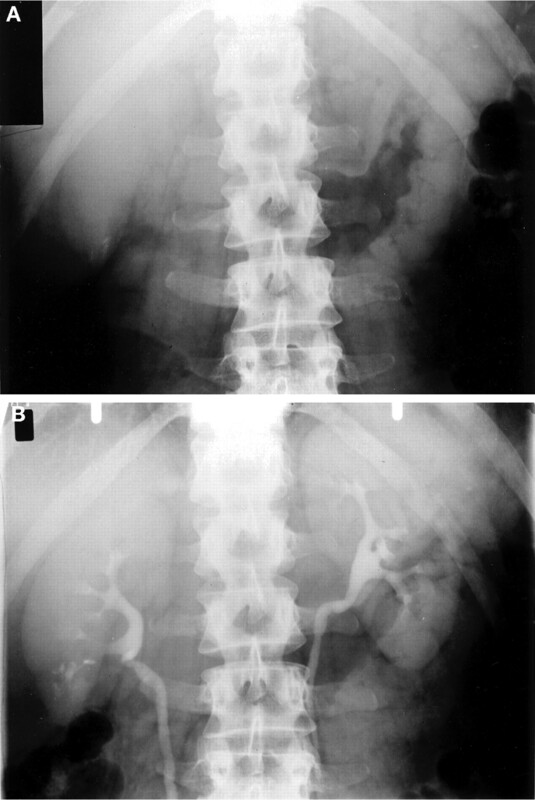 (B) Five-min film showing an abnormal calyx with some loss of renal substance. There was a sterile pyuria, and Mycobacterium tuberculosis was isolated from the urine. (A) Plain film showing renal calcification. (B) Twenty-min film showing ureteric dilation and stricture and an irregular bladder wall. M. tuberculosis was isolated from the urine. Ultimately, a tuberculous kidney may become calcified and nonfunctioning. Not surprising, if the gross anatomic distortion is advanced and bilateral, the GFR will fall and, in some patients, there is progression to end-stage renal failure. It now is clear that tuberculosis can affect the kidney more insidiously. In one report, three patients with advanced renal failure, in whom imaging showed equal-sized smooth kidneys, were described (9). In none was tubercle bacilli found in the urine. Renal histology revealed chronic tubulointerstitial nephritis with granuloma formation in all three and caseation in two. In two, acid-fast bacilli were identified with appropriate stains. Two of the three patients had evidence of tuberculosis on chest x-ray, and one had tuberculous peritonitis. Subsequently, there have been additional reports of this atypical form of tuberculosis, which in the United Kingdom seems to occur particularly in individuals from the Indian subcontinent. When the diagnosis has been made while useful renal function remains, it sometimes has been possible to arrest the fall in GFR (Figure 3) or even produce improvement. In some of these patients, there is pyuria, but in others there is not. 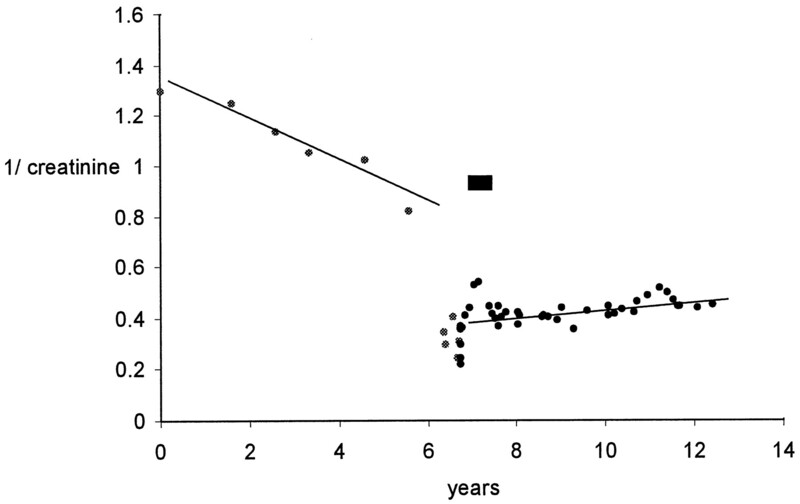 Graph of reciprocal creatinine (mg/dl) against time in one patient to illustrate arrest of decline of renal function after treatment of renal tuberculosis. Bar indicates treatment with antituberculosis drugs and prednisolone for 6 mo. Chronic tuberculosis sometimes is complicated by amyloidosis, which, in India, is an important cause of renal disease (10). There are a number of case reports of tuberculosis associated with various forms of glomerulonephritis, but no firm associations have been established. There also is a case report of miliary tuberculosis complicated by focal proliferative glomerulonephritis: immune deposits were present but no granulomas (11). Tuberculosis, although an uncommon cause of progressive renal failure, is an important one because, unlike many renal conditions, it is potentially preventable and easily treatable. Evidence as to the extent to which tuberculosis is a cause of end-stage renal failure worldwide is scanty. Whereas most of the world's tuberculosis is in developing countries, registries of patients with end-stage renal failure are mainly in the developed world, as are diagnostic methods for arriving at a renal diagnosis. For these reasons, there is little information on the contribution that tuberculosis makes to the burden of renal disease. In 1991, data obtained from the European Dialysis and Transplant Association registry revealed that 195 of 30,064 new patients (0.65%) had renal failure caused by renal tuberculosis, an incidence similar to that of previous years (12). The country with the highest incidence was Greece (4.51% of new patients), other important contributors being Portugal, Belgium, Spain, Italy, and Yugoslavia. In the United Kingdom, tuberculosis is very uncommon as a primary renal diagnosis; in April 2001, the national database contained 25,338 patients, 60 (0.24%) of whom had been assigned renal tuberculosis as their renal diagnosis (D. Ansell, personal communication, April 2001). From published data on primary renal diagnosis from the United States, Europe, and Australasia (13), it is clear that tuberculosis is more common in Europe as a primary renal diagnosis (2247 cases [0.7%]) than in either the United States (0.004%) or Australasia (0.16%). There are a number of reports of tuberculosis developing in patients on regular hemodialysis. Commonly, the patient manifests fever, anorexia, and weight loss and usually either is known to have had pulmonary or other forms of tuberculosis or is a member of a high-risk ethnic or social group. Often the recrudescence is extrapulmonary, so it is likely that, in most cases, the disease is due to reactivation of past disease rather than a primary infection. In a study of more than 300 hemodialysis patients in St. Louis, Missouri, it was found that 48 of 307 patients tested had a positive tuberculin skin test. Chest radiographs were done, but no new cases of tuberculosis were found (14). There are fewer reports of tuberculosis in chronic ambulatory peritoneal dialysis (CAPD) patients, but there is no reason to suspect that the risk is any different from patients on hemodialysis. There are a number of reports of tuberculous peritonitis (15, 16), which is easier to detect in patients on CAPD than in those on hemodialysis. In Turkey, a region with a high incidence of tuberculosis, 4 of 70 children on CAPD developed tuberculosis—affecting the lung in 3 and the bone in 1 (17). Disease caused by environmental mycobacteria also occurs in hemodialysis patients; it usually becomes apparent as pulmonary or disseminated disease or sometimes as skin lesions. Some infections have occurred as the result of contamination of the dialysis machine by environmental mycobacteria. In patients on peritoneal dialysis, there have been reports of peritonitis; such an eventuality usually necessitates removal of the catheter and transfer of the patient to hemodialysis. Tuberculosis is a serious complicating factor in renal and other forms of transplantation, with an incidence, depending on geographic region, of 0.35 to 15.0% (18). In most cases, the disease involves the lung, but the disease is disseminated in one third of cases. Patients who have had tuberculosis while on dialysis are at increased risk, and it should be remembered that immunosuppression can obscure the diagnosis by producing false-negative tuberculin tests (14). In Saudi Arabia, 14 cases of tuberculosis developed among 403 renal transplant patients, an incidence approximately 50 times higher than in the general population of that country (1). Infections caused by environmental mycobacteria also occur in transplant patients, accounting for 29% of patients with mycobacterial disease in one review series (1). Because the symptoms often are masked by the immunosuppression, diagnosis may be delayed and the mortality is high: approximately 30%. It is the policy of many renal transplant units to give isoniazid prophylaxis for 1 yr to patients who are thought to be at particularly high risk of developing active tuberculosis. It is possible, by following this policy, to prevent reactivation of tuberculosis. In a series of 633 renal transplant patients, there were no cases of tuberculosis among patients who received chemotherapy but 6 cases among 27 high-risk patients who did not receive chemotherapy (19). A retrospective study of 520 renal transplant patients from Turkey adds weight to this policy (20). Tuberculosis was diagnosed in 22 patients, a mean of 44.4 mo after transplantation. The pleuropulmonary form was the most common (54%). Despite treatment, six of the patients died, one of isoniazid toxicity. In contrast, 23 patients who were at risk of developing tuberculosis had been given isoniazid prophylaxis for 1 yr. None of the 23 developed tuberculosis, and in none was toxicity seen. In our unit, we give isoniazid for 1 yr to patients who are at risk of developing tuberculosis, but, clearly, differing risks have to be considered. There would be a case, on the one hand, for stopping the chemoprophylaxis in patients whose immuno-suppression is reduced early but, on the other hand, continuing the isoniazid longer if high levels of immunosuppression are needed beyond 1 yr. In men, the site most commonly involved is the epididymis, followed by the prostate. Testicular involvement is less common and usually is the result of direct invasion from the epididymis. It is generally believed that tuberculous prostatitis results from antegrade infection within the urinary tract; epididymitis, however, probably is the result of blood-borne infection because it often is an isolated finding without urinary tract involvement (21, 22). It is important to be aware that a high proportion, perhaps 50 to 75%, of men with genital tuberculosis have radiologic abnormalities in the urinary tract, so the urinary tract of all such patients should be investigated. In women, there is no close correlation between urinary tract and genital tuberculosis; indeed, renal tract tuberculosis accompanies lesions of the reproductive tract in fewer than 5% of cases. There are a number of reports, in patients who are treated by chronic hemodialysis, of an association between both disseminated and genitourinary tuberculosis and hypercalcemia (23,24,25). In one case, hypercalcemia was not observed until the patient had been on dialysis for 8 mo and it coincided with the development of persistent fever (23). Calcitriol levels were elevated, but circulating levels of parathyroid hormone were not. The patient was found to have widely disseminated tuberculosis. Hypercalcemia also has been reported in a CAPD patient with tuberculous peritonitis (26). Hypercalcemia is widely known in patients who have disseminated tuberculosis and who do not have renal failure or renal involvement. In such patients, levels of calcitriol (1,25-(OH)2D3) are known to be elevated, presumably as a result of increased synthesis of this active form of vitamin D by activated macrophages within the granulomas (27). A microbiologic diagnosis of tuberculosis usually is made by isolation of the causative organism from urine or biopsy material on conventional solid media or by an automated system such as radiometry. Acid-fast bacilli may be seen on microscopy of centrifuged urine, but care must be taken when very few bacilli are seen, because these may be environmental mycobacteria that contaminate the lower urethra. Full technical details are given by Collins et al. (28). In recent years, nucleic-acid amplification techniques, such as PCR, have been investigated extensively for the detection of M. tuberculosis and other mycobacteria in clinical specimens, notably sputum. Relatively few studies have specifically evaluated PCR for detection of genitourinary tuberculosis, and these show the technique to be sensitive and specific, although some urine specimens contain inhibitory substances (29, 30). In addition, PCR has been used to detect mycobacterial DNA in urine in cases of HIV-related disseminated tuberculosis (31). Tuberculosis may involve the kidney as part of generalized disseminated infection or as localized genitourinary disease. The morphology of the lesions depends on the site of infection, the virulence of the organism, and the immune status of the patient. The kidney frequently is involved in miliary (“septicemic”) tuberculosis where blood-borne miliary tubercles are seen throughout the renal substance, most noticeably in the cortex. The lesions measure up to 3 mm in diameter and usually are pale or white. Histologically, they consist of epithelioid granulomata, with or without caseation, and often contain Langhans-type giant cells. Organisms usually can be demonstrated microscopically within these lesions but sometimes are difficult to find. Renal function usually is not compromised in these patients. When the patient is immunosuppressed, the granulomas may be less well formed and organisms may be more readily demonstrated. Caseous necrosis is seen less frequently. When immunosuppression is severe and in cases in which the infective organism is one of the environmental mycobacteria, such as M. avium-intracellulare (32), the lesions may be more diffuse and poorly formed than the usual miliary lesions; the granulomatous response consists of histiocytic cells with abundant pale cytoplasm packed with organisms (“multibacillary histiocytosis”). Caseous necrosis is not a feature. In some patients with pulmonary or disseminated tuberculosis, there is evidence of renal failure without typical miliary involvement or localized genitourinary lesions. In these cases (see the section Tuberculous Interstitial Nephritis), biopsy has shown interstitial nephritis, usually but not in all cases with granulomata. The evidence that the renal malfunction is due to a combination of infection and immunologic renal damage is arrest of decline or even improvement in function with a combination of antituberculosis treatment and corticosteroids (Figure 3). The kidney usually is infected by hematogenous spread of bacilli from a focus of infection in the lung. In most cases, at the time of presentation there is no evidence of active pulmonary disease, although there may be clinical or radiologic evidence of past infection, suggesting that renal involvement occurs as a result of reactivation after a period of dormancy (33, 34). Clinically, renal tuberculosis usually presents unilaterally, but post mortem studies undertaken in the first half of the 20th century indicate that the disease frequently is bilateral (35, 36). If a tuberculous lesion in the lung gains access to the vascular system by erosion of the wall of a vessel, usually a vein, then emboli containing organisms may be disseminated throughout the body. However, the bacilli have stringent growth requirements and generally tend to proliferate only in a small number of sites, including the kidney, epididymis, fallopian tube, bone marrow, and brain, particularly the hindbrain. In the kidney, the site of preference is the renal medulla, where the lesions produced are confluent epithelioid granulomata with caseous necrosis, leading to local tissue destruction. The infection may cause vascular insufficiency of the papillae by damaging vessels, and papillary necrosis may ensue (Figure 4). 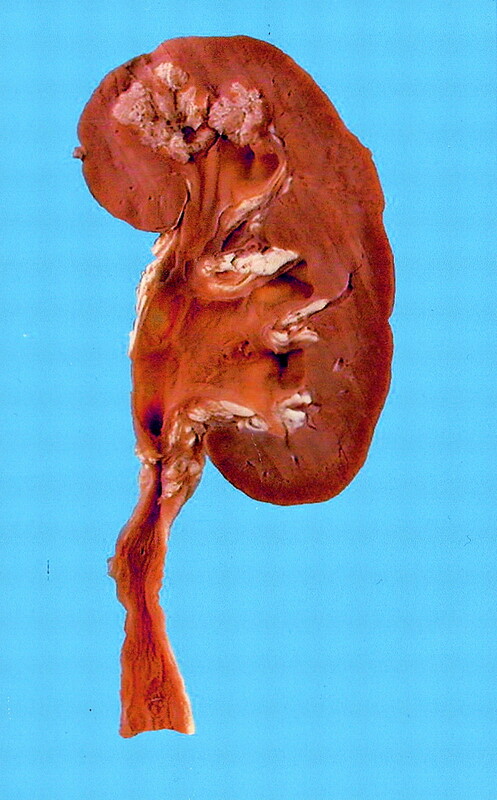 Spread to the renal pelvis produces a tuberculous pyelonephritis that may even progress to a pyonephrosis-like lesion, also known as a “cement” or “putty” kidney (Figure 5). Scarring develops within the renal pelvis with calcification in 24% of cases, identifiable as renal or ureteric stones in up to 19% of cases (37). Infection frequently spreads down the ureters into the bladder, producing mucosal and mural granulomatous lesions associated with scarring. The clinical consequences of an extensive renal lesion include autonephrectomy. The destructive renal lesions may spread outside the renal capsule and produce a mass lesion, which can mimic a neoplasm (38). Ureteric involvement also may produce irregular ureteric strictures and segmental dilation, leading to obstruction and/or reflux. Recognition that ureteric obstruction and reflux sometimes may be due to tuberculosis may prevent an unnecessary nephrectomy if active treatment, including relief of obstruction, can be instituted early (33, 39). Secondary bacterial infection of the urinary tract is common. Keratinizing squamous metaplasia may develop as a late complication of chronic inflammation and infection of the renal pelvis and may persist even after treatment of the active tuberculous lesion (40). This is a potential risk factor for the development of squamous carcinoma in chronic cases. Tuberculous infection involving renal papillae with associated papillary necrosis. Note also the dilation and irregularity of the ureter, which also is involved. 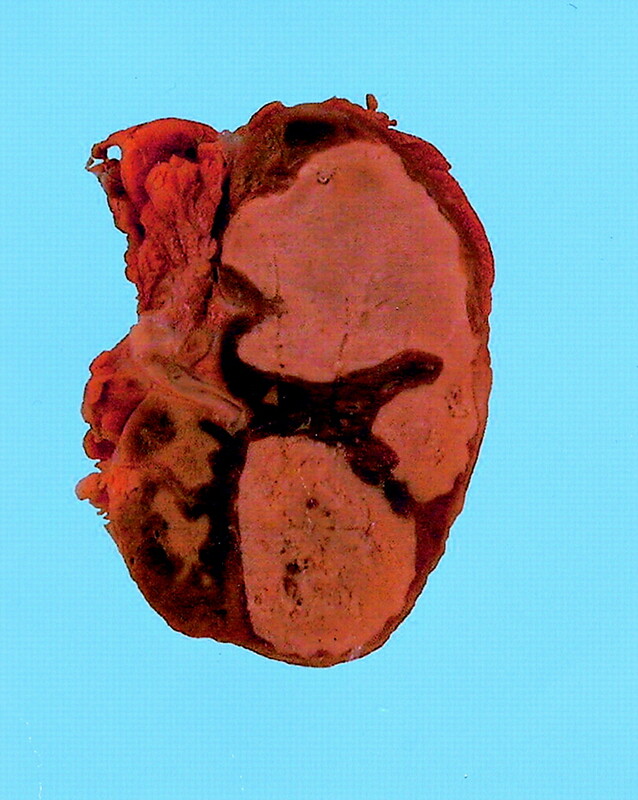 Tuberculous “pyonephrosis” with extensive caseous necrosis and renal parenchymal destruction. Up to three quarters of instances of tuberculous bladder infection are associated with renal infection, although in some cases tuberculous cystitis is believed to be due to spread from the epididymis. An acute mycobacterial cystitis commonly is induced by local instillation of BCG for the treatment of urothelial carcinoma in situ and superficial bladder cancer. Usually this causes only a self-limiting, low-grade, superficial cystitis, but sometimes the inflammatory reaction is more severe. Cases of disseminated infection have been recorded, and ureteric involvement with ureteric obstruction was observed in 0.3% cases in a large series (41). Renal involvement was found in 0.1% of the 2602 patients in this series, presumably from ascending infection rather than hematogenous spread. Histologically, the lesions caused by BCG are indistinguishable from those seen in classical tuberculosis, and caseation may be present. Organisms may be demonstrated by standard techniques such as Ziehl-Neelsen staining. Approximately 10% of all cases of tuberculosis worldwide in 1999 were HIV related, but in sub-Saharan Africa, the percentage was much higher, as high as 60% in some regions. The incidence is expected to rise in Africa and also in Asia. Tuberculosis was the cause of death in approximately 30% of the 3 million patients who were dying of AIDS in 1999. In those who are only mildly immunosuppressed, the disease resembles that in HIV-negative individuals. In the more profoundly immunosuppressed, particularly those with CD4+ T-cell counts of 50/cu.mm or lower, a high viral load, and a negative tuberculin test, the disease often is disseminated and the kidney is involved incidentally with various pathologic manifestations, including granulomatous interstitial nephritis. The incidence of renal involvement may be higher than currently believed. In an autopsy study in India, 24 of 35 kidneys from patients who died of AIDS showed evidence of infection, including 17 cases of tuberculosis (42). In a similar study in Mexico City, renal disease was demonstrable in 87 of 138 (63%) autopsies on AIDS patients: infection was the cause of the renal disease in 36 cases, with 19 being due to M. tuberculosis (43). There is good evidence that a fall in serum 25-OH-vitamin D levels compromises cell-mediated immune defenses and leads to the activation of latent tuberculosis (27,44). In a predominantly vegetarian population of Asians of Gujarati origin living in West London, those with undetectable serum 25-OH-vitamin D levels had an almost 10-fold increased risk of active tuberculosis (45). The relation between 25-OH-vitamin D levels and the risk of genitourinary tuberculosis in this population is uncertain as this form of tuberculosis is relatively uncommon in this group. Modern short-course antituberculosis drug regimens are effective in all forms of tuberculosis. They are based on an initial 2-mo intensive phase of treatment in which, usually, four drugs—rifampicin, isoniazid, pyrazinamide, and ethambutol (or streptomycin)—are given, and these destroy almost all tubercle bacilli. This is followed by a 4-mo continuation phase in which only rifampicin and isoniazid are given, with the aim of eliminating the few remaining near-dormant, persisting bacilli. For success, all doses must be taken, and because a failure to comply with therapy is the major cause for treatment failure, the World Health Organization has stressed the importance of direct supervision of therapy. To render such observation easier for both patient and supervisor, the drugs may be given twice or thrice weekly during the continuation phase. Details of therapy are available from the World Health Organization (46). In recent years, there has been a worrying increase in the incidence of multidrug-resistant tuberculosis, which, by definition, is caused by bacilli resistant to rifampicin and isoniazid, with or without resistance to other drugs (47). Therapy requires the use of at least four drugs that are selected, on the basis of drug susceptibility tests, from ethionamide, prothionamide, quinolones (e.g., ofloxacin), newer macrolides (e.g., clarithromycin), cycloserine, kanamycin, viomycin, capreomycin, thiacetazone, and para-amino-salicylic acid. These are less effective and often more toxic and/or costly than the first-line drugs. Duration of therapy is based on bacteriologic response but may be 18 mo or longer (48). Special considerations apply to the treatment of tuberculosis in patients with impaired renal function. Rifampicin, isoniazid, pyrazinamide, ethionamide, and prothionamide may be given in normal doses because they are either eliminated in the bile or broken down to metabolites that are not excreted by the kidney. By contrast, care is required in the use of streptomycin, other aminoglycosides, and ethambutol because these are wholly excreted via the kidney. Ethambutol causes optic neuritis, which may be irreversible, and reduced doses should be given according to the GFR: 25 mg three times weekly if the GFR is between 50 and 100 ml/min and twice weekly if it is between 30 and 50 ml/min. Streptomycin and other aminoglycosides are ototoxic and nephrotoxic and should be avoided if possible in patients with impairment of renal function, especially those on cyclosporin, because they have a high risk of nephrotoxicity. Encephalopathy is an uncommon complication of isoniazid therapy and usually is preventable by the prescription of pyridoxine (25 to 50 mg/d). A few patients on hemodialysis have developed isoniazid-induced encephalopathy that did not respond to pyridoxine, but the condition resolved when isoniazid was withdrawn. Rifampicin increases the rate of metabolism of a wide range of drugs, including corticosteroids, cyclosporin, and tacrolimus, which often are given to transplant patients. Regular measurement of blood concentrations of cyclosporin and tacrolimus in such patients is recommended. An additional complication is encountered in HIV-positive patients who are receiving highly active antiretroviral therapy because these drugs interact adversely with rifampicin. At present, it is recommended that rifabutin be given instead of rifampicin and that the duration of therapy be extended to 9 mo (49). Recommendations may change, so the most recent guidelines issued by the Centers for Disease Control and Prevention (Atlanta, GA) should be consulted. Surgical intervention is indicated in cases of advanced unilateral disease complicated by pain or hemorrhage and for bladder augmentation. Surgical excision of nonfunctioning kidneys or extensive lesions in partly functioning kidneys is controversial. Relief of ureteric obstruction by stenting or percutaneous nephrostomy may aid functional recovery, especially in patients with good renal cortical thickness, limited renal involvement, and a GFR of more than 15 ml/min (39). The treatment of disease caused by environmental mycobacteria depends on the in vitro drug susceptibility of the organism. Expert guidance should be sought from national mycobacteria reference centers. Tuberculosis is a common disease worldwide and as shown above has many implications for the nephrologist. In developed nations, tuberculosis is relatively uncommon, but the risk of acquiring the disease is increased in immunosuppressed individuals, including patients on dialysis and recipients of kidney transplants. The signs and symptoms of renal tuberculosis mimic those of other infections of the kidney, so diagnostic awareness may prevent unnecessary morbidity. Diagnosis is not easy, but developments in nucleic acid-based bacteriological tests are very promising. Thanks to Dr. Sandra Gibson for photographs of kidney specimens from the Pathology Museum of St. George's Hospital. The hands of John Snow: clue to his untimely death?